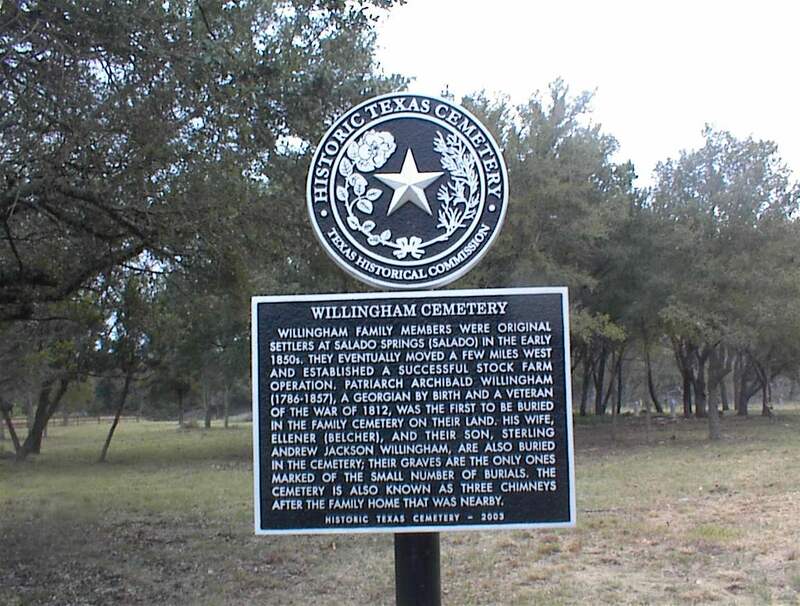 The Willingham Cemetery, also known as Three Chimneys Cemetery, is located near the Willingham Branch of Salado Creek, north of Farm Road 2843 in the Hidden Springs subdivision of Salado, Bell County, Texas, USA. The 2.5 acre cemetery remains a private family burial area. In 1852, Archibald Willingham (1786-1857) and his family moved from their double log cabin at Salado Spring to an area about five miles west of Salado that became known as Willingham Spring. Their home place, known as Three Chimneys, which included this cemetery, was the centerpiece of a stock farming operation for over a century. 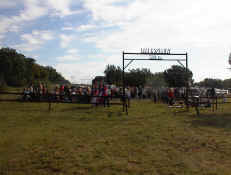 Archibald Willingham was the first Anglo-American settler at Salado Springs, and members of his family have lived in the area continuously since 1850. 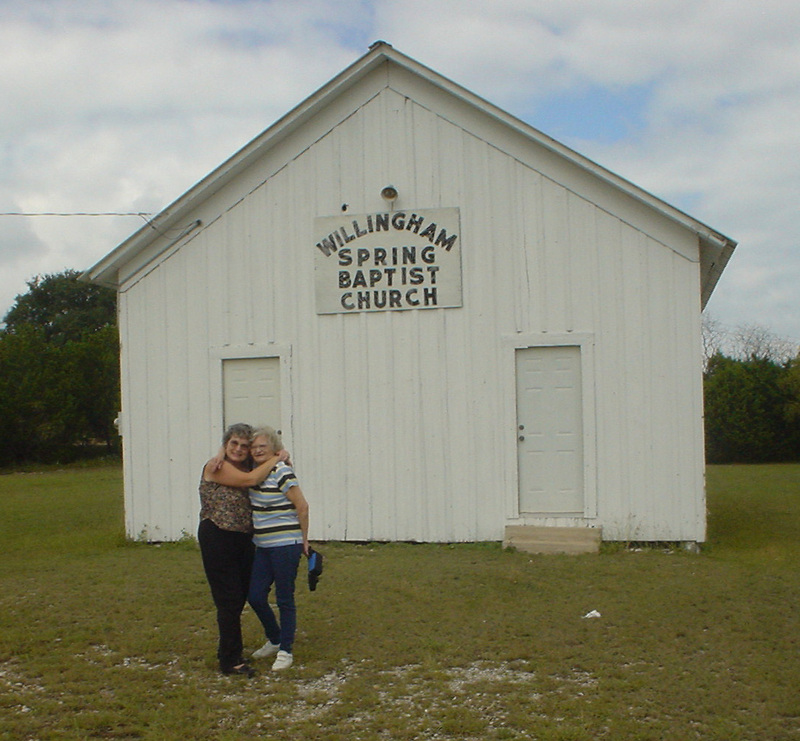 Over the years, a small community, never more than 100 persons, evolved at Willingham Spring. The centerpiece of the community was a small, primitive wooden church building with a high-pitched roof built between 1911-1914, on land donated by ranch owner Wilson Willingham (1878-1965), a grandson of Archibald Willingham. This building is located five miles west of IH-35 on Farm Road 2843 and is about 1.5 miles south of the Willingham Cemetery. It has been awarded a subject marker by the Texas Historical Commission. 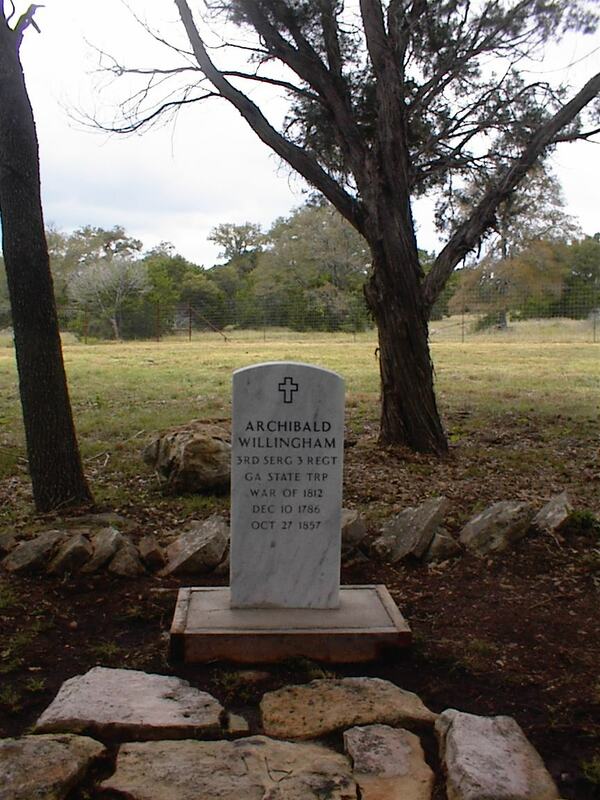 The earliest burial at the Willingham Cemetery is patriarch Archibald Willingham. He died on October 27, 1857. The first Texas Historical Marker to identify an historical site, Salado Springs, references Archibald Willingham as its first settler. Archibald Willingham, a physician, a surveyor and a stock farmer, was born December 10, 1786, in Richmond County, Georgia, USA. He was a veteran of the War of 1812, in which he served as a sergeant in Captain Thomas Carr's Company of Georgia Militia. He was a captain in the Monroe County Georgia Militia in 1823. Willingham apprenticed in medicine during his service and practiced for a time after his discharge. 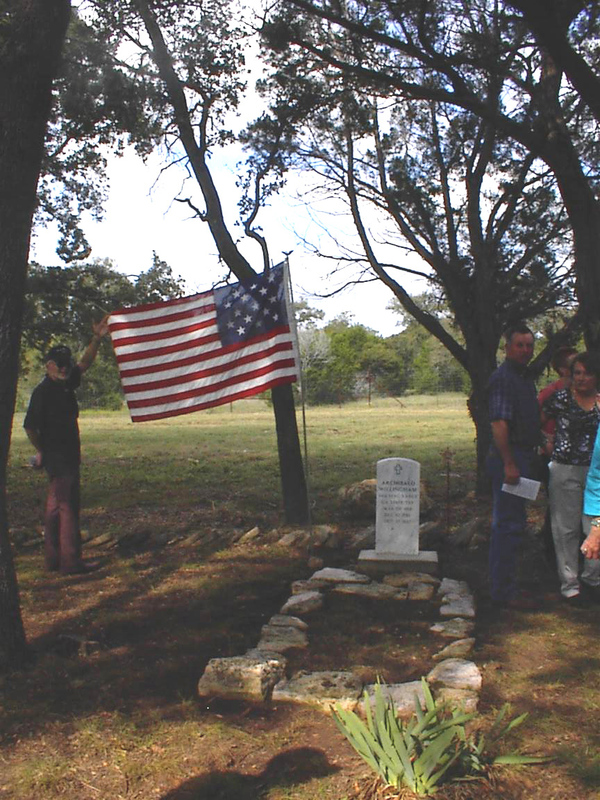 He is the only known veteran of the War of 1812 buried in Bell County. 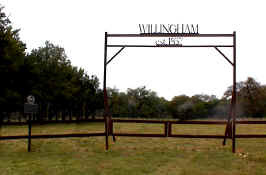 Willingham arrived in the Republic of Texas in 1839, settling in Independence, Washington County. He is known to have participated in the politics of the Republic. His name appears in a document dated November 10, 1843, naming five individuals to draft a preamble and resolutions expressive of a meeting between a committee of citizens of Independence and Anson Jones, the last President of the Republic. 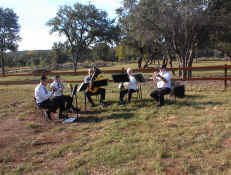 In October of 1850 he and at least two of his sons moved to Salado Springs. He was a trained surveyor and was involved in activities related to the formation of Bell County in 1850. A few years later he helped survey the site of the original capital in Austin (1853). Archibald is buried next to his wife, Eleanor (Ellener) Belcher Willingham (1794-1874) and near his youngest son, Sterling Andrew Jackson Willingham (1833-1871). Sterling Andrew Jackson Willingham, known as "Jackson" or "Jack", was born June 13,1833, at King's Gap, Harris County, Georgia, USA and dried February 10, 1871, in Bell County, Texas, USA. He was six years old when his family arrived in Washington County, Texas, USA in 1839, and 17 when he moved to Salado Springs in 1850 with his father and his brother, Wilson Lumpkin Willingham (1829-1906). S.A.J. Willingham (Jack) served the Confederacy as a First Lieutenant of Company G, 4th Regiment, Arizona Brigade, from 1862-1865 and was stationed at various points in central and south Texas. The only marked graves at Willingham Cemetery in 2004 are Archibald Willingham (1786-1857), his wife Eleanor Belcher Willingham (1794-1874), and their son Sterling Andrew Jackson Willingham (1833-1871). There are also the graves of five apparently infant or stillborn children, unmarked, which are presumed to be the children of Wilson Lumpkin Willingham (1829-1906), and his wife Elizabeth Yarberry Willingham, who are buried in the old Killeen Cemetery. Outside the family plot, demarcated by stone, are at least four additional unmarked burials, presumably slaves or persons unrelated to the Willinghams. A stone border, presumably placed by family members many years ago delineates the perimeter of the Willingham Cemetery. A bed of irises continues to thrive. 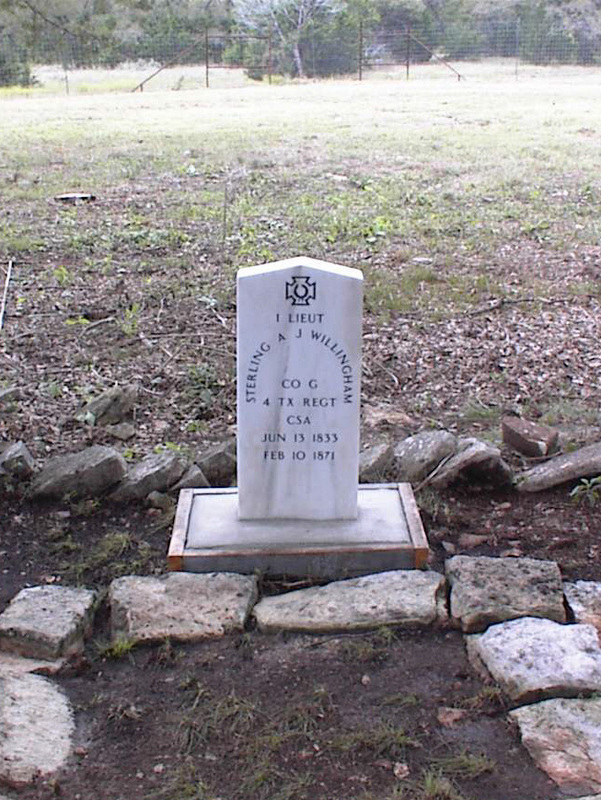 The three above-mentioned Willingham burials were initially marked by crude, handmade limestone markers, but government-issued veteran headstones for Archibald Willingham (War of 1812) and his son, Sterling Andrew Jackson Willingham (Confederate States of America) were installed in 2004. 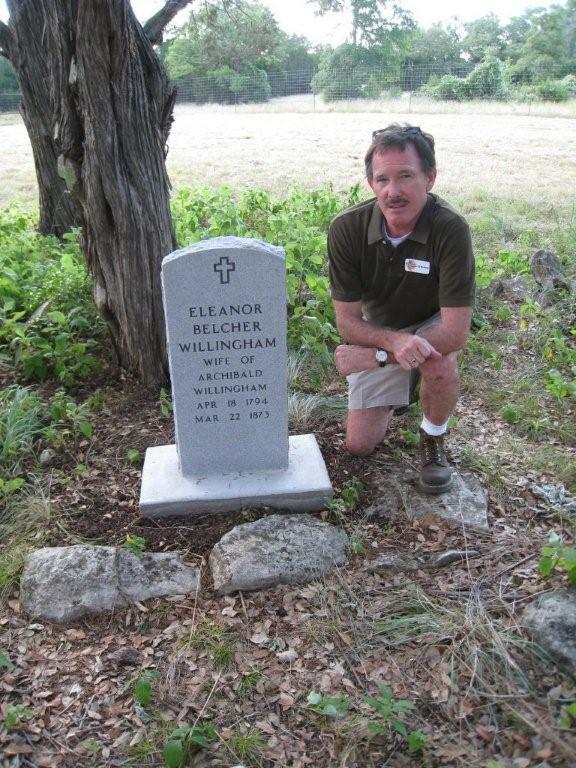 The marker for Eleanor Belcher Willlingham was donated by Douglas Barton Willlingham and his family (featured in photo) with financial help by Jerry Willingham and Katherine Willlingham Woerner. 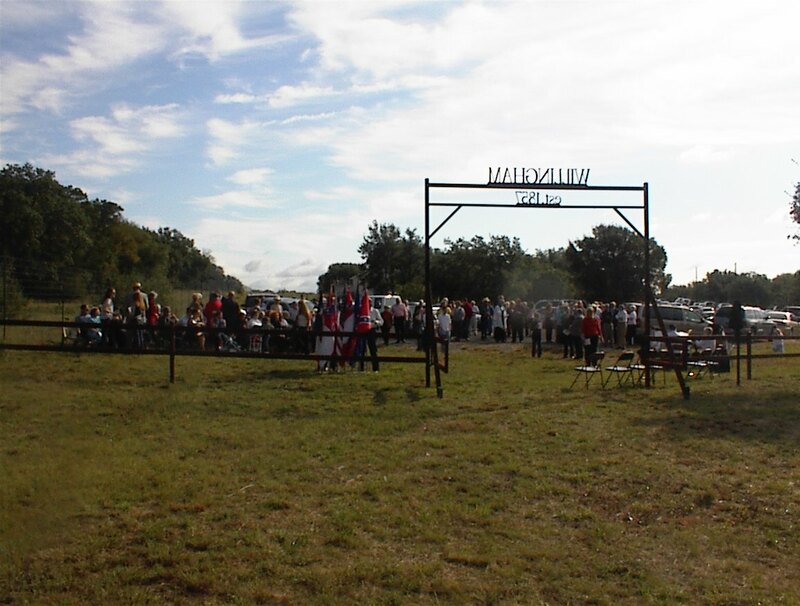 Willinghams from all over Texas and Florida and friends gathered at the Willingham cemetery to officially honor Three Chimneys pasture cemetery in remembrance of those buried there. 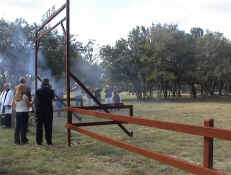 The following well-planned ceremony was carried out. A reception was held afterward at the home of Dr. Douglas B. Willingham in Salado, Texas, USA. I present you this Official Texas Historical Marker to be set apart at this sacred site. R: And from your gifts do we give to you. R: And your splendor to their children. Almighty God, we thank you that you have put it into the hearts of your people to make offerings for your serice, and have been pleased to accept their gifts. 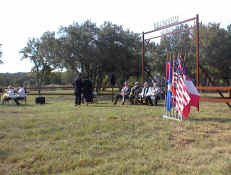 Be with us now and bless us as we set apart this Official Texas Historical Marker to your praise and glory at this, the Willingham Cemetery, through Jesus Christ our Lord. Amen. Almighty God, we remember before you today your faithful servants, the members of the Willingham family, whose remains have been interred at this site; and we pray that, having opened to them the gates of larger life, you will receive them more and more into your joyful service, that, with all who have faithfully served you in the past, they may share in the eternal victory of Jesus Christ our Lord. The grace of our Lord Jesus Christ, and the love of God, and the fellowship of the Holy Sprit, be with us all evermore. Amen.